Lauren Etter reported in today’s Wall Street Journal that, “Little over a year ago, ethanol was winning the hearts and wallets of both Main Street and Wall Street, with promises of greater U.S. energy independence, fewer greenhouse gases and help for the farm economy. Today, the corn-based biofuel is under siege. With respect to ethanol supply, the article stated that, “The low prices reflect soaring output. Global ethanol production has grown to a projected 13.4 billion gallons this year, from 10.9 billion gallons in 2006, according to the International Energy Agency. The U.S. production is more than half of that total, or about seven billion gallons this year, up 80% in two years. It equals less than 4% of U.S. gasoline consumption. Meanwhile, Richard Simon reported in today’s Los Angeles Times that, “With oil prices in record territory, presidential candidates stumping for votes in corn-centric Iowa, and congressional Democrats anxious to pass an energy bill to cut the nation’s dependence on Mideast oil, this should be the right moment for ethanol. Mr. Simon went on to provide this analysis: “Pro-ethanol Democrats and farm groups want the bill to require a nearly fivefold increase by 2022 in the amount of home-grown alternative fuels that must be blended into gasoline. They say the mandate would reduce U.S. dependence on foreign oil and help America’s farmers. “Democrats on the other side, joined by environmental and food-industry groups, think the mandate could raise the price of corn used for food; harm the environment by using more land to produce biofuels; and gouge taxpayers by expanding ethanol subsidies. Later, the L.A. Times article pointed out that, “In 2005, when it drafted the last energy bill, Congress decided to require that 7.5 billion gallons of ethanol be added annually to U.S. gasoline supplies by 2012, an amount expected to be reached soon. California uses about a billion gallons of ethanol. “At the heart of this year’s dispute on Capitol Hill is the Senate bill’s renewable fuel standard, which would mandate 36 billion gallons of alternative fuels by 2022 — up to 15 billion from corn-based ethanol. After 2016, an increasing portion would have to be advanced biofuels, including cellulosic ethanol produced from plant materials, such as switch grass and wood chips, thought to be easier on the environment than corn-based ethanol. 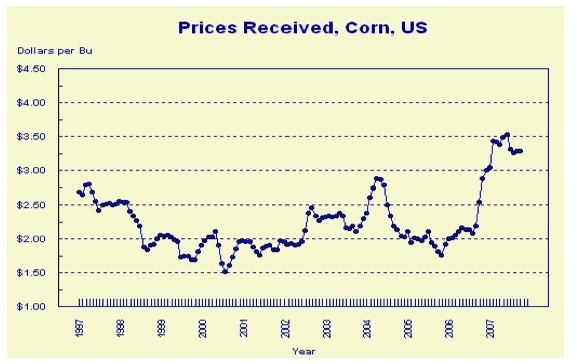 And near the article’s conclusion, Mr. Simon noted that, “About 24% of the nation’s corn is expected to go to ethanol production this year, up from 13% in 2004, before Congress enacted the ethanol mandate. In other news coverage regarding the Energy Bill, John M. Broder reported in today’s New York Times that, “Congressional negotiators are nearing agreement on a measure to set significantly higher fuel economy standards for cars and light trucks, according to aides and lobbyists following the talks. Mr. Broder indicated that, “The House and Senate passed broad energy legislation earlier this year, but they have been unable to resolve differences between them. The fuel economy measure is considered among the most effective ways to reduce the consumption of oil — which is selling at near-record prices — and the production of greenhouse gases that contribute to the warming of the atmosphere. DTN writer Chris Clayton reported yesterday that (link requires subscription), “The greatest danger to the ethanol industry is the divide in agriculture over the renewable fuel that truly came to the forefront in 2007, Sen. Charles Grassley said Tuesday. “In his weekly call with agriculture reporters, Grassley, R-Iowa, said the short-term view on ethanol taken by livestock producers such as cattle feeders is dangerous, and is the first time that agriculture has not been united on ethanol production. (To listen to Sen. Grassley’s radio news conference from yesterday, just click here). In other news regarding biofuels, the Associated Press reported on Monday that, “A plant once called ‘Gold of Pleasure’ that flourished thousands of years ago in Europe could be a promising new crop – and source of energy – for farmers in the arid U.S. High Plains. “A new project announced last week in Montana and a provision in the farm bill moving through the U.S. Senate could jump-start production of the crop, now called camelina. The AP article stated that, “The farm bill also includes a provision authored by Sen. Max Baucus, D-Mont., to extend renewable energy tax credits to camelina, along with other language that would include the crop in other farm programs. “But not everyone is on board yet. Camelina is new enough that many people don’t even know what it is. “It has been mocked by some politicians in Washington who don’t like the $286 billion farm bill, saying it’s too expensive and full of extra money to help lawmakers win re-election. And Matthew L. Wald reported in today’s New York Times that, “A Portuguese oil company, Galp Energia, plans to announce today that it is building a 6,500-barrel-a-day plant to make diesel fuel from vegetable oils using a method akin to refining oil. “The method, developed by UOP, a subsidiary of Honeywell, and Eni, the Italian energy company, adds hydrogen to oils derived from food crops to create a substitute that the companies describe as superior to ordinary diesel fuel. The Congressional Research Service (CRS) recently updated a report entitled, “Possible Expiration of the 2002 Farm Bill,” which was written by Jasper Womach (Nov. 16). In part, Mr. Womach explained that, “The mandatory commodity support programs authorized in the 2002 farm bill cover the 2007 crops. So, all subsidy obligations related to calendar year 2007 production are covered by the law. For commodity support programs, there is little reason to enact a farm bill before the end of the calendar year. In fact, past farm bills generally have been enacted late in the year, after the end of the fiscal year. The 1981 and 1985 farm bills were enacted in late December, and the 1990 farm bill was enacted in late November. 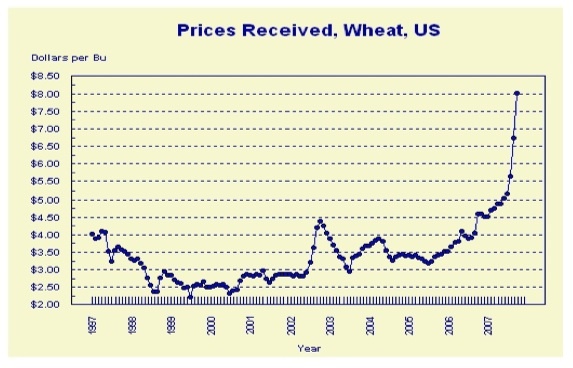 What was expected to be the 1995 farm bill was not enacted until April 4, 1996, the most extreme case of belated action. Even in that case payments were made on the 1995 crops and farmers went ahead with planting operations for their 1996 crops. Alan Beattie reported today at the Financial Times Online that, “The European Union has reached a trade deal with an east African bloc – its second success in persuading developing countries to sign such agreements before an end-of-year deadline. The article noted that, “The EU has been accused by development campaigners of coercing the African, Caribbean and Pacific group of nations into signing deals by the end of 2007, when current agreements expire. Reuters news reported yesterday that, “Brazil and Canada called on Tuesday for the World Trade Organization (WTO) to investigate U.S. farm subsidies, which they said break WTO rules. The article explained that, “Under WTO rules, Brazil and Canada can now repeat their request for dispute panels at the next meeting of the WTO’s dispute settlement body on December 17 and they will be established. “Countries that are the subject of a WTO dispute can object once to the establishment of a dispute panel, but cannot veto it the second time. “If all three countries agree, the two disputes could be consolidated and handled by a single panel. The release added that, “Collins has served as USDA Chief Economist for the past 15 years overseeing USDA’s program of market forecasts and projections. Collins’ 32 years of federal service has included leadership with wide-ranging impact in the economic analysis of agricultural policy, energy and bioproducts, risk assessment and cost-benefit analysis, and global climate change. Collins has also served as Chairman of the Board of Directors of the Federal Crop Insurance Corporation for the past 7 years and Chairman and Vice Chairman of the USDA Graduate School. His key roles in USDA farm bill activities began with the 1985 farm bill and continued with frequent testimony on behalf of USDA in congressional hearings and briefings.